1) The Decontextualized Detail Shot - Not only do we not know who these people are, we don't even know what else they're wearing! 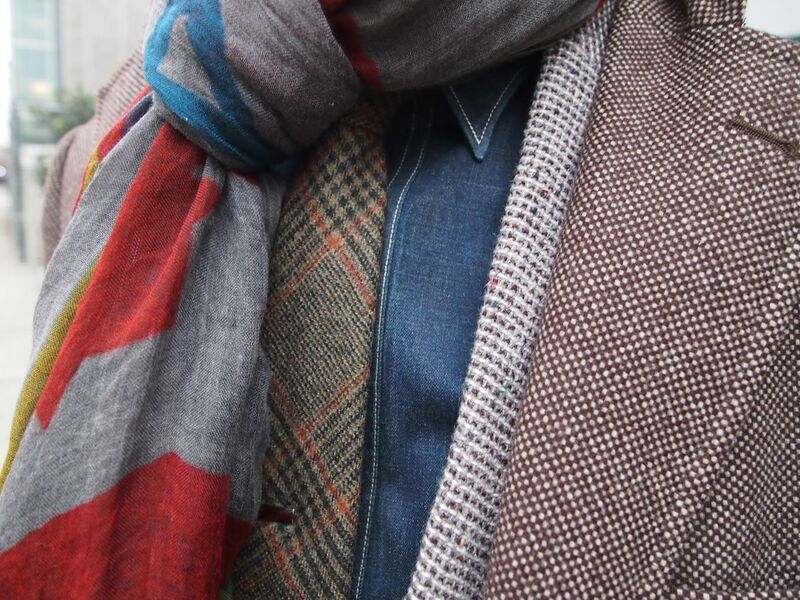 Fashion, after all, is in the details. Why not just depict them? But these shots also provide insight we wouldn't get otherwise. Reposted from Mister Mort. The detail here gives emphasis to the play of patterns and clash of textures. Reposted from Jak and Jil, The focus on only the lower half of the body adds drama and mystery. 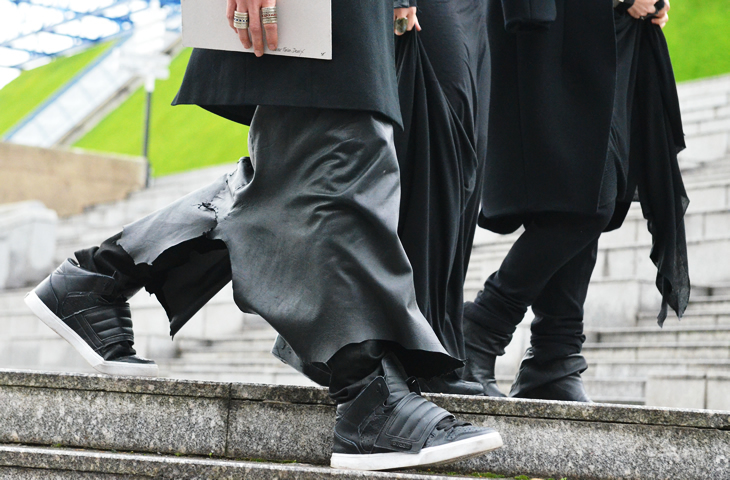 The shoes striking concrete is quite appealing, as is the bat-like starkness of the skirt bottoms. Also, the decontextualization creates an interesting androgyny. I don't know whether, in fact, to read the stabs of fabric as skirt bottoms at all. 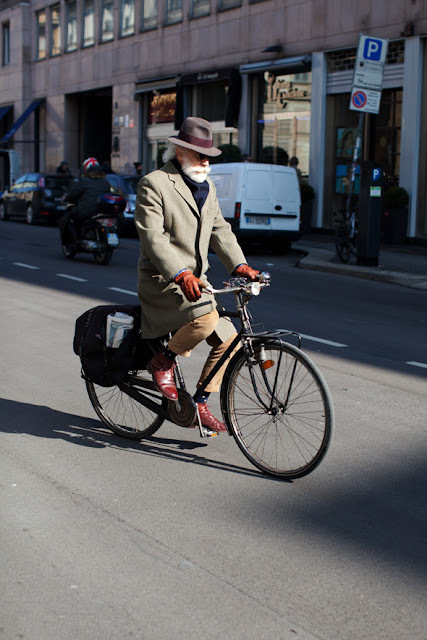 2) The classy/sophisticated older gentleman on a bike - I have vested interest in this trend. After all, I will be an old man someday, not perhaps, that long from now. And I fully intend to ride a bike when I become one. In fact, I am already practicing for the part - except for the riding a bike thing. I've also started the process of incrementally accruing old man wardrobe items so that I will be well equipped when the time comes. Old man style never goes out of style. It's all the rage among the kids these days. 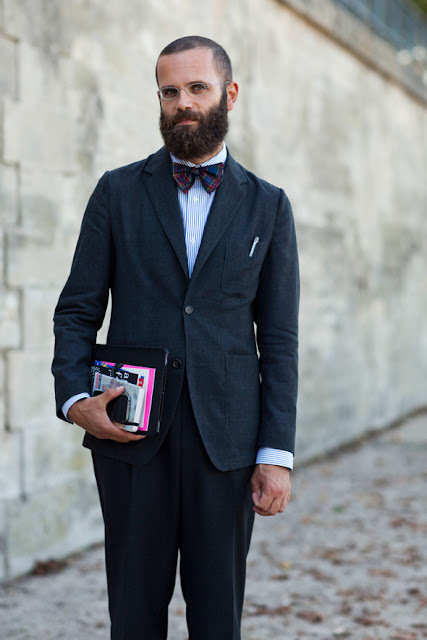 Reposted from The Sartorialist. The old man on a bike look is even more awesome with a big bushy beard! 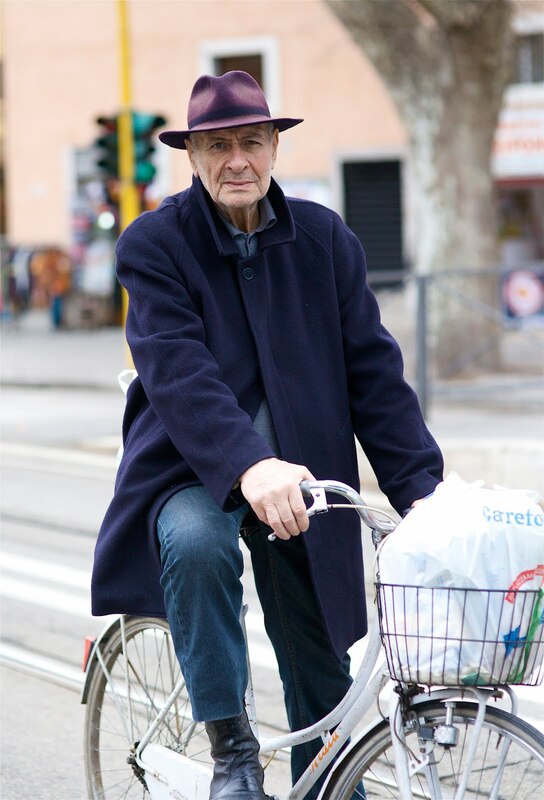 Thank you, Scott Schuman, for doing your part to make old man on a bike style such a fashion staple. You, no doubt, are more responsible for this trend than anyone. This shot, I admit, is sort of cheating. 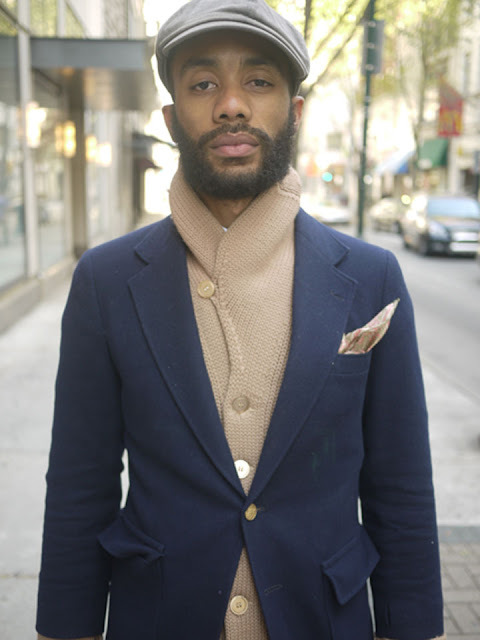 It comes from Advanced Style, a street style blog (if that's the right word) dedicated entirely to older individuals. Nonetheless, it's a beautiful example of the trend. 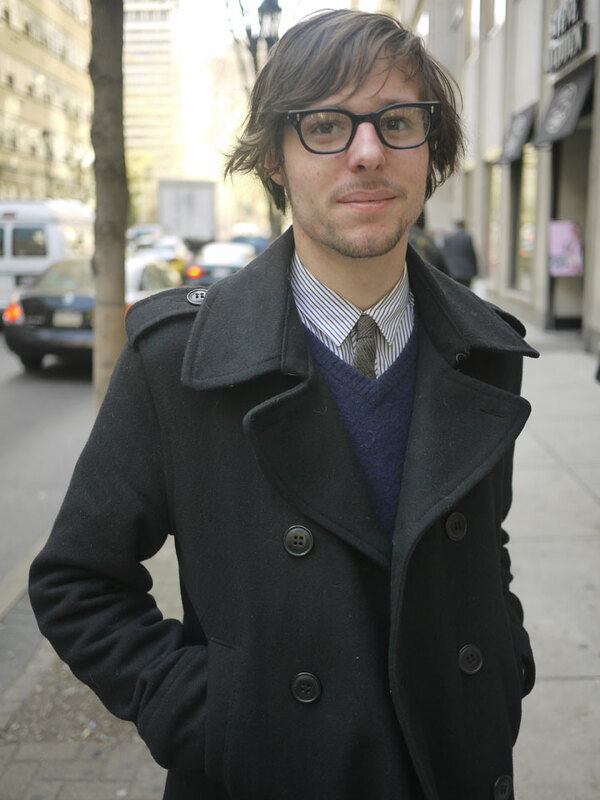 If you haven't checked out Ari Seth Cohen's blog, you should. It's rather fabulous. He also has a book coming out. 3. Gratuitous shots of Angelo Flaccavento- Or perhaps this is a misnomer. There are no gratuitous shots of Angelo Flaccamento. There are only good, and even better shots of Angelo Flaccavento. The Italian fashion journalist has made himself into a critical capture of any street style photographer worth her weight in salt. And I can understand why. He has done nearly as much for promoting old man style as Scott Schuman, not to mention what he's done for beards, bow ties, and horned-rim glasses. The idolatry has been earned. And these shots, by the way, are only the tip of the Angelo iceberg. He's been featured everywhere from Citizen Couture to Mister Mort. I need to stop expecting supposedly hip neighborhoods to exude their hipster sheen at whatever hour I choose to shoot there. Hip is not a mid-afternoon weekday phenomenon. Or maybe- and this is a distinct possibility- hip stops looking hip the longer you stare at it. Its roots start to show through. One hoodie blends into another. I can no longer recognize cool. Or... oh damn! I liked that outfit. Too late. She's already getting in her car. Should have been paying more attention. Clearly the normalcy of blogging is disproportionately distributed in Philadelphia. In Center City, people practically seemed to be expecting to be photographed. Or at least, they weren't particularly taken aback when I asked. After all, if you google "street style philadelphia" nearly every shot you'll find was taken in Rittenhouse Square. Street style is becoming a regular thing there. Not so much in West Philly. The denizens of Baltimore Ave (roughly between 43rd and 52nd) responded to me with a mixture of curiosity and suspicion. "Who is this dude with a camera?" I imagined them thinking. "And what does he want?" I had my first rejections today. "Sorry, I'm a little camera shy," this girl told me. Fair enough. "Nah, we're okay," this guy said to me after his friend, sizing me up, asked me if I had any credentials to show him. "No," I told him. "I don't have credentials. I have a blog." Sal, just off Baltimore Ave, West Philadelphia. She was in a hurry to meet a friend but graciously posed for me anyway. 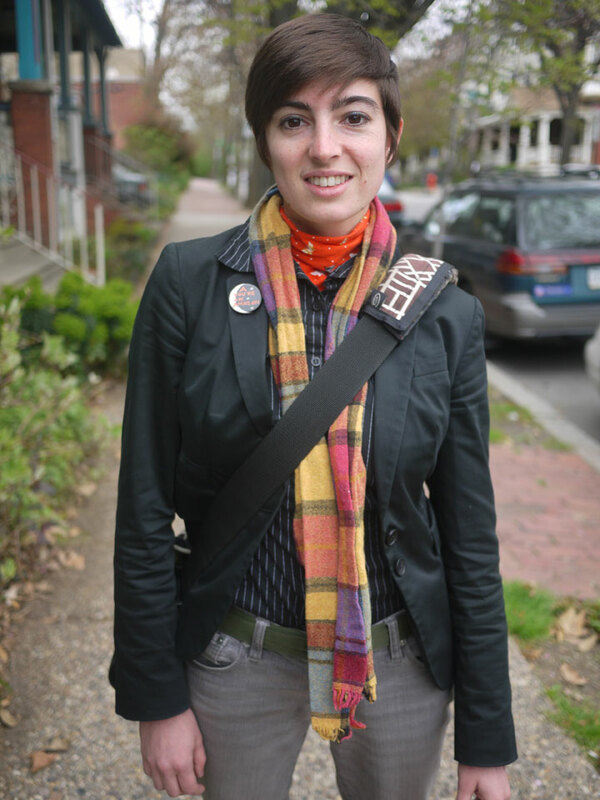 I dig the way she infuses punk and hippy elements into West Philly hip. 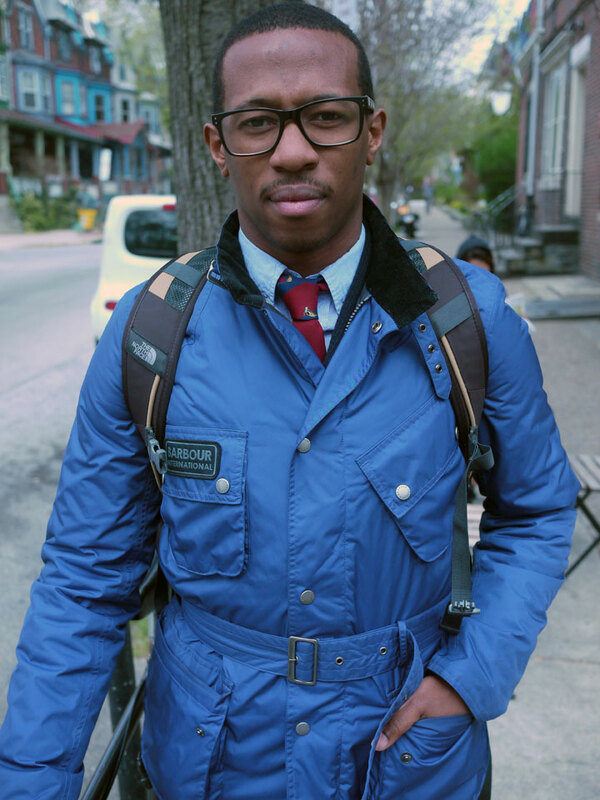 Teddy, Baltimore Ave, West Philadelphia. Just leaving the Green Line Cafe. Biking in ties is not just for gray-bearded Milanese professors anymore! I'm glad we're getting a little of Pitti Uomo in University City these days. I didn't go on a shoot today, but I was still shooting in my head. The fashion gaze, once turned on, is hard to turn off. Tomorrow, West Philly. Mandi, Walnut St, Philadelphia. She says to me, "There's a lot of you guys out here, huh?!" I say, "Seems like it," or something to that effect, and she tells me this is the third of fourth time she's been shot by a blogger recently. Bloggers, we are a veritable army! 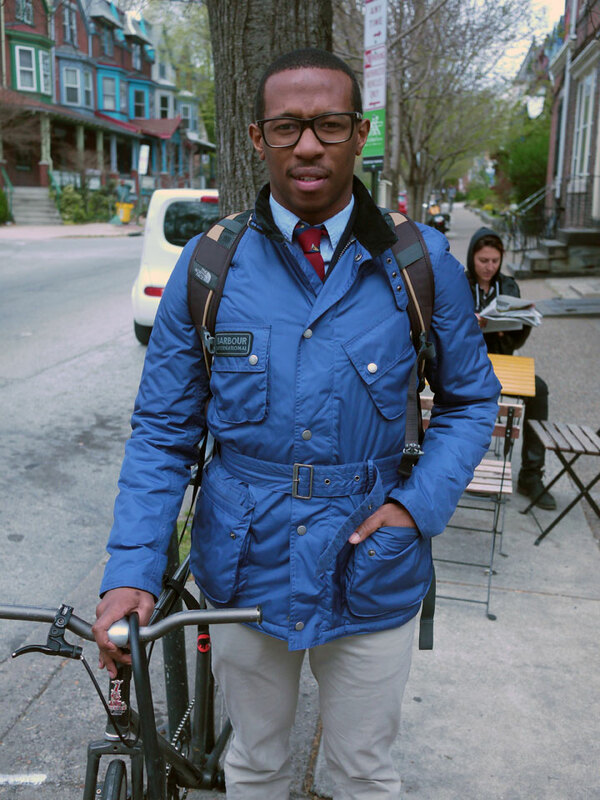 Brian, Walnut St., Philadelphia. He works for some retail clothing store or other in the neighborhood and asked me to give a shout out to them. Sorry, Brian! I didn't catch which. Feel free to mention them in the comments section. My first day of street style blogging was a qualified success. I spent three hours out and ended up with several good images. Of course, they were all of the same guy, Erik, a photogenic vintage shop owner, who seemed utterly unphased being asked to be photographed for a street style blog. I got the impression this wasn't his first time. Here are some of the lessons I learned from my first day of shooting: 1) most people aren't all that distinctive. It can take hours just to find someone interesting to shoot. Plus, it took me close to two hours just to work up the nerve. 2) Street style shots are best done in high traffic areas. South Street and Passyunk on a windy Monday afternoon = not so good. 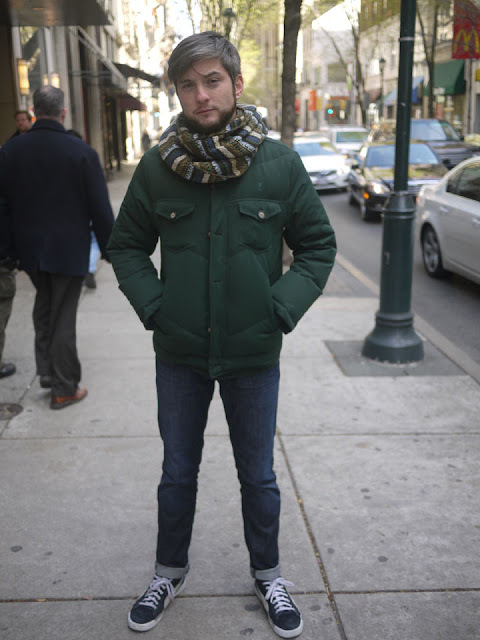 Walnut St and Rittenhouse Square proved more fruitful, even if less populated with hipsters. And 3) if you want to get a good shot, you have to stop moving. The more you move, the less you see and the slower your response time. Better to become a fixture. This is the official launch and debut post of Urban Fieldnotes, a blog and research project devoted to documenting style on the streets of Philadelphia and beyond, as well as the efforts of other bloggers to document style on the streets of Philadelphia and beyond. 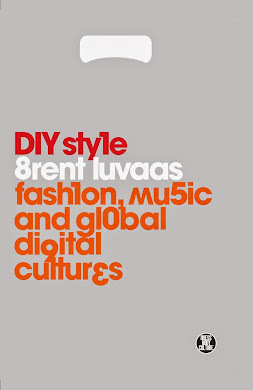 It is a street style blog about street style blogs, representing my efforts to make sense of street-style blogging as a social and cultural phenomenon by throwing myself head first into street-style blogging as a practice. It is, in other words, a street style blog for theory nerds. Stay tuned for pretty pictures and inchoate ideas. I will be posting regular photos of trends and styles I observe on the streets of Philadelphia, or whatever other city I happen to be visiting, along with my thoughts, analyses, and comments, all delivered, I promise, with a bare minimum of snark. I will also be posting my interviews with other bloggers, links to other interesting, cool, or bizarre street style blogs I’ve come across in my research, and my interpretations, as they occur to me, of the stuff I find. This blog, then, is something of an experiment in open-source ethnography. I will be posting my fieldnotes as I write them, exposing all those incipient ideas we anthropologists usually keep locked away in computer files until they’ve hatched into something more sophisticated. I am already cringing a little at the thought of this. I’m used to spending countless hours polishing my ideas into peer-reviewed journal articles that come out years after they’ve stopped being interesting to me. This whole self-publishing while it’s fresh on my mind thing is going to take some getting used to. So, please, bear with me. I am going to say stupid things. I am going to be wrong a lot of the time. I am going to stick my foot in my mouth repeatedly. 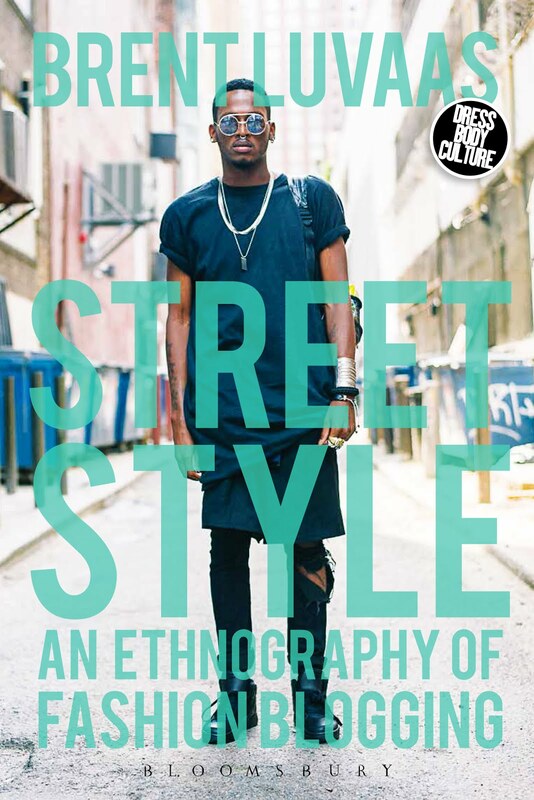 But this, I propose, is what street style anthropology should be: immediate, direct, unfiltered. Now here’s the part where I ask for your help: please comment on my posts and help me get street styling blogging right. Let me know what you think. Let me know where I go wrong, what I’m missing, what sites I should be checking out or writing about, where I should be snapping photos and of whom. Your comments will help shape what this project becomes. They will give me guidance and direction. And they might—you should know— also find their way into one of my articles, presentations, or books on the subject. But whether they do or not, I promise to read and engage with your posts regularly. So, without further ado…let the posts, and public unraveling of this anthropologist, begin.